My company giving discounted price for PDA phone. Interested email me (jjamain@yahoo.com). I have no idea about DVB-H receiver. I guess it's something to receive TV mobile in Singapore. But this is so cool features. We can watch TV and record it on-the-go. With 802.11g Wifi, this is a perfect handset. The only concern is the size of the handset. Additional functions Onboard DVB-H receiver; email; Nokia Web Browser; Series 60 platform; electronic program guide; automatic channel discovery. As wireless hotspots spring up like toadstools, Internet devices designed to take advantage of this trend are sprouting up as well. 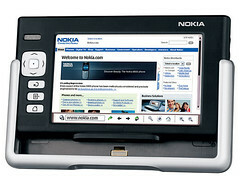 Enter the Nokia N770 Internet Tablet (5.5 x 3.1 x 0.7 inches; 230g). Not necessarily a smart phone or a traditional handheld, the N770 is designed to provide a mobile user with Internet access either via Wi-Fi or by connecting to a Bluetooth-enabled cell phone. Packed to the gills with a host of productivity applications and multimedia features, the N770 is a promising device. That said, while it works with a myriad of multimedia, its lack of support for native Microsoft file formats such as WMA and WMV will limit its appeal. Also, as more robust smart phones appear on the mobile landscape, it remains to be seen how many users are willing to carry two devices when, in many instances, one will suffice. 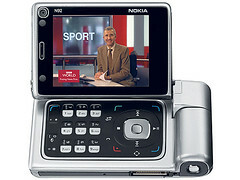 The Nokia N770 is currently available only in selected countries in Europe and America. No word from Nokia as to whether the product will be available in Asia. Upside: With a relatively large screen that measures 4.13 inches diagonally (in Landscape orientation), the N770 should provide a more enjoyable Web-surfing experience than many of today's smart phones. Additionally, with integrated Wi-Fi (802.11b/g) and Bluetooth, connecting to the Internet via either protocol should be a breeze. The N770 also ships with a plethora of multimedia features, including an Internet radio; several media players; and support for MP3, RealAudio, MPEG-4, AAC, WAV, AMP, and MP2 audio formats as well as MPEG-1, MPEG-4, RealVideo, and AVI video formats. 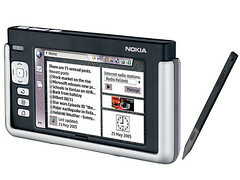 The N770 will run a Linux-based Nokia Internet Tablet 2005 software edition and ship with a Web browser, an email client, a news reader, an image viewer, and a PDF viewer. Downside: Though it supports a ton of multimedia files, the Nokia N770's incompatibility with native Microsoft formats may turn off potential buyers. Plus, taking into account the device's robust multimedia functionality, we wish it shipped with more than 64MB of DDR RAM, 128MB of embedded flash memory (64MB of which is user accessible), and a 64MB Reduced Size MultiMediaCard (RS-MMC). Also, the RS-MMC card is limited to a maximum capacity of 256MB. Finally, the device's onscreen keyboard isn't the most user-friendly method for inputting information and composing email. 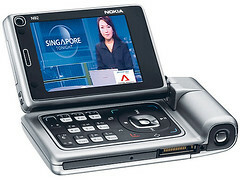 Outlook: The Nokia N770 Internet Tablet is no doubt an interesting device that holds a lot of promise. Considering the ubiquitous nature of wireless hotspots, the N770 could be useful. That said, while smart phones grow ever smarter, the need to lug around multiple devices is shrinking, and we wonder if the N770 has enough appeal to lure in buyers. Be sure to check back later for a full review.